An incident in a Philadelphia hospital waiting room not only captured front-page headlines but also underscored the growing hazards patients face in seeking emergency care throughout the United States. 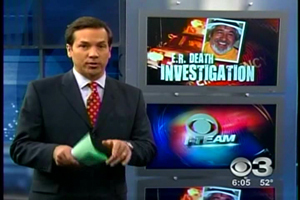 While the theft was the focus of news stories, Rivera’s death exemplified what some experts term a “national crisis” in emergency room care. As ER patient demand increases and the number of facilities shrinks, overcrowding has resulted in longer waits and, ultimately, poorer care. If you or a loved one suffered a severe injury or death due to poor or delayed treatment at a hospital emergency room in Pennsylvania, New Jersey or Delaware, you may want to contact an attorney. Kline & Specter, PC, a Philadelphia law firm with more than 40 lawyers, five of whom are also doctors, has the experience to litigate emergency room lawsuits. The firm offers free medical malpractice case evaluations and represents clients throughout Pennsylvania, New Jersey, Delaware and nationwide. Kline & Specter has handled and is currently litigating a number of emergency room cases, including one in which a middle-aged father of two was evaluated by a physician assistant for chest pain and discharged with a diagnosis of a gastrointestinal malady. Ten hours later, the patient suffered cardiac arrest and died. Other Kline & Specter emergency room cases include that of an improperly intubated baby who suffered oxygen deprivation and died, misdiagnoses of a young man’s epidural abscess which resulted in paralysis, and the death of a four-year-old boy who was kept waiting for three hours in an ER waiting room and then never administered a prescribed medication to prevent seizures and his eventual cardiopulmonary arrest. In another case, a middle-aged man was discharged by ER personnel despite showing symptoms of stroke and later died after suffering extensive hemorrhagic bleeding in his brain. The Institute of Medicine (IOM) in a report several years ago noted the myriad of problems faced by emergency rooms. It noted that the number of patient visits grew by 26 percent over a 10-year period (1993-2003), while over the same time the number of emergency departments declined by 425 nationally with nearly 200,000 fewer hospital beds available. This resulted in longer waits and also ambulances being diverted from crammed ERs to other hospitals that were often further away. The IOM report tallied such diversions at 500,000 yearly, or roughly one every minute. The report also noted that three-quarters of hospitals said they had difficulty finding specialists, such as neurosurgeons, to take emergency and trauma calls. And because of a growing lack of health insurance, many on-call specialists wound up getting no compensation for treating emergency room patients. Many emergency rooms also were not equipped to handle young patients, the report said, with most children – who comprise about a quarter of all ER visits – treated at general hospitals less likely to have pediatric expertise and equipment as do children’s hospitals. Call a Kline & Specter emergency room injury lawyer at 800-243-1100. We represent emergency room injury victims and their families in Philadelphia, New Jersey, Delaware and throughout Pennsylvania.